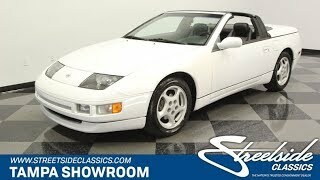 Hi, I am interested in your 1996 Nissan 300ZX (stock #1678-TPA) listed on Autotrader for $12,995. I'd like to get more information about this vehicle and confirm its availability. The new class of Japanese classic cars is starting to get red hot, and the 1996 Nissan 300ZX convertible has it all. This example shows a carefully preserved life with a great color combo and loaded with the right features. So theres nothing in the way of you enjoying this affordable modern classic. 1996 is the last year for this legendary Z-car generation in America, and it is the rarest of the run. It looks like a shark on land with the flush-mounted headlights and sleek sheetmetal. But theres more there than just aggression. The precision-built body still retains great lines more signs of a well-respected life in the desirable climates of Arizona and Florida. And the way Arctic White Pearl reflects in the sunshine really highlights how great the body is. This is believed to be the original application, and it has that pearlescent glow that reminds you these were expensive machines. Against all this white is a the black on the rear panel and soft rubber trim. It gives the car a nice contrast, especially when the snug-fitting black roof is in place. If you like the way the black roof looks against the white paint, then youll love taking the top down to reveal the crisp full black interior. This one really has a race car inspired feeling, right down to the well-integrated roll hoop that adds rigidity. You and your passenger get nicely bolstered bucket seats that both individually power adjust to your ideal position. The dash is low, giving excellent sight lines. All the controls are at your fingertips, with many as close as the edge of the instrument panel. As Nissans flagship, this Z came with loaded with features like power windows, power locks, power mirrors, dual airbags, and now an upgraded AM/FM/CD stereo with aux input. And because you know you want to enjoy this droptop long into the summer, the R134a air conditioning is blowing nice and cold. On a car so well preserved this far, its great to see a very stock appearing motor. After all, the 3.0-liter DOHC V6 is a truly marvelous motor. With 222 horsepower on tap, this fuel-injected, multi-valve powerplant loves to rev, and it makes a wonderful guttural growl at full throttle. And while these hardy engines are always ready for modifications, its nice to see one that was just treated to good maintenance. In fact, part of the appeal of a sports car like this is it fires up as reliability and has the same everyday usability as any other Nissan. This is backed up by great cruising features like the four-speed automatic transmission w/overdrive, power steering, and cruise control. But the moment you feel like hitting the open road, the fully independent sports suspension, Michelin Pilot Sport tires on factory 16-inch alloys, and four-wheel disc brakes remind you instantly how the Z car has earned its racing stripes. Complete with owners manual, its amazing this well presented and loaded droptop sports car is so affordable. Thats you know you need to hurry on this deal. Call today!! !